If you are using LimeWire client then why not get the best of it - LimeWire Ez Booster helps you do just that. This amazing application is designed to retrieve all the loss occurring when using file-sharing network in the process of download. It proposes both a wonderful, futurist-looking and easy-to-operate interface. 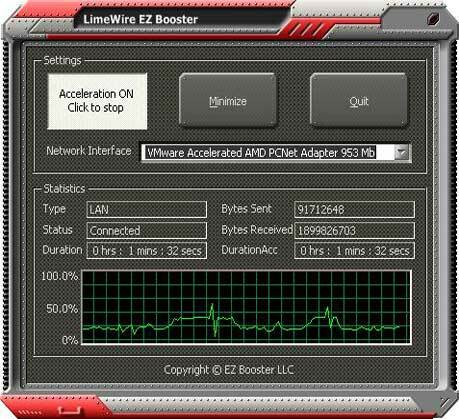 LimeWire-EZ-Booster is FREE and 100% CLEAN! NO ads, adware, spyware, Trojans or any other malware bundled!